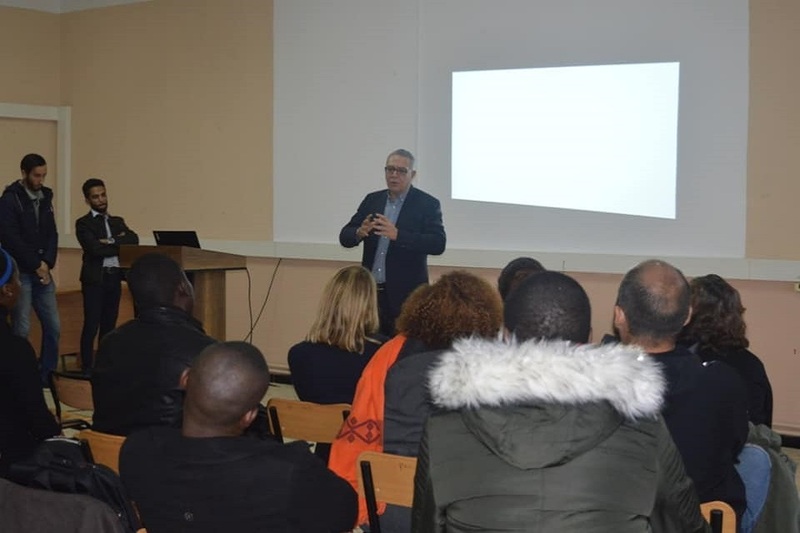 PAUWES held a meeting with partners from GIZ Addis Ababa and Tlemcen, Algeria that took place on Sunday 20th January 2019 at PAUWES building. It brought direction of PAUWES, Professors, Doctors and Lecturers visiting the Institute, Members of the Administrative staff of PAUWES, as well as Students representatives of the PAUWES student bodies and clubs; namely; Community of Practice (CoP), Entrepreneurship and Innovation club, PAUWES Climate Change and Gender Club (PCCGC) and JuaJami group all together and where CoP and the two clubs made presentations about their visions and missions. The director opened the meeting by welcoming the visiting partners, Professors and Doctors, Administration staff and students present. He expressed his gratitude to the visiting personnel for their unfailing commitments to seeing how well the students are representing and bringing up innovative solutions that will boost the visibility and impact of the Institute. He then opened the floor for the four (4) student clubs/initiative to commence presentations. The first presentation was by the Juajami team where they gave a holistic presentation on the Juajami initiative, their challenges and successes so far. The guests were subsequently invited to give their contributions and ask questions. Following, was the presentation by the Community of Practice. Similarly, they presented on the workings of the CoP, the structure and roles of the teams under the Community of Practice, the current projects of the community as well as the CoP social platform for all its stakeholders. The third presentation was by the Entrepreneurship and Innovation team, wherein they highlighted the success stories of the club, its current engagements and future prospects. Lastly, the PCCGC presentation where they similarly discussed the overview of the club, its involvements, success stories as well as future prospects. At the conclusion of the student’s presentations, the Director gave a closing speech and partners of GIZ present commended the laudable innovations and activities of the students and encouraged them to keep on with the good work as they are willing to support their innovative ideas at any time. 0 responses on "PAUWES meeting GIZ from ADDIS ABABA"